Dr. Jeffrey Gosin has dedicated his career to the treatment of individuals with vascular and vein diseases. He is Board Certified in both Surgery and Vascular Surgery. He is a graduate of the University of Pennsylvania and Jefferson Medical College. He completed his General Surgery residency at Robert Wood Johnson University Hospital where he was Chief Surgical Resident. After his residency, he remained at Robert Wood Johnson and completed an accredited fellowship in Vascular Surgery where he received extensive training in traditional “open vascular surgery,” minimally invasive procedures, performed medical research, and had numerous papers published in scientific journals. Dr. Gosin has a special interest in minimally invasive techniques and new medical technology and constantly strives to provide the most advanced state-of-the-art therapies to his patients. He was the first surgeon in his region to perform a stent graft repair of an abdominal aortic aneurysm, a treatment that is now the standard for most most patients. 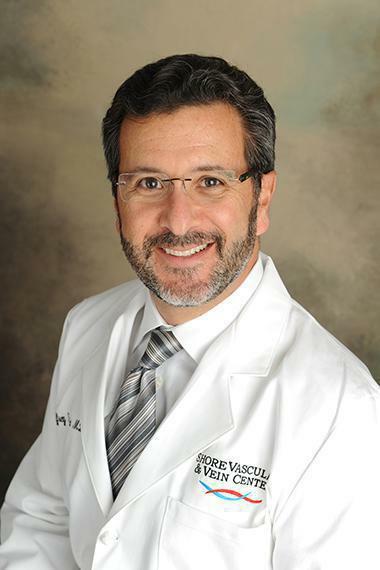 He is a leader in minimally invasive vascular and vein treatments. Other physicians have travelled to his center to learn these techniques. His dedication to the treatment of the circulatory system led to the development of Shore Vascular & Vein Center (formerly Jersey Shore Center for Vascular Health.) In 2003 he became Chief of Vascular Surgery at Shore Memorial Hospital (now Shore Medical Center) and Medical Director of The CardioVascular Institute at the hospital.